ጥያቄ፦ "ቅዱስ ሲኖዶስ ስለ ማኀበረ ቅዱሳንስ ምን ወሰነ? የአዲስ አበባ ሀ/ስብከትስ ጉዳይ?" Dear deje selam! Do you have any information about the today´s meeting of the Holy Synod? 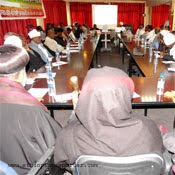 You have written about the transfering of Abune Samuel to development commission of EOTC. Could you answer the following my questions please? 1.Who is appointed as an archbishop to A.A Hagere Sebket? 2.What kind of decision is passed to solve the problem of Mahebere Kedusan? It was one of the expected agendas. የቤተክርስቲያን ጠላቶች ደጀ ሰላም ላይ ምን እየሰሩ ነው? ስለ ቅዱስ ሲኖዶስ ስብሰባ የሪፖርተር ጋዜጣ ሪፖርታዥ:- "የቅዱስ ሲኖዶሱ ጉባዔ ያለስምምነት ተበተነ"
When ever the history of the Ethiopian Orthodox Tewahido Church is raised, one finds the archbishops and patriarchs who contribute a lot for the expansion, growth and glorification of the Church. Abune Fremnatos the first Patriarch of Ethiopia has accomplished his apostolic duty by preaching the nation and translating religious and other canonical books to the Ethiopic language Geez. His effort to spread Christianity in Ethiopia has been intensified by the nine saints who introduced and expand monastic life for the church. The 13th century archbishops of Ethiopia Archbishops Abune Michael and Abune Gabriel, who played significant role in reconciling administrative and theological split between Bete Tekle Haymanot and Bete Ewstatitos and protected the church from the herestic teaching of Estifanos, can never be forgotten1. During the reign of Susnyos, Archbishop Selama died defending his faith from Jesuits missionary plot2 .The recent past 20 th century story also tells us how Archbishop Petros, Archbishop Michael, Patriarch Baslious and Patriarch Teweflos died for their religion and beloved country . step by step, became a tyrant. declared that the dress for a Patriarch should be white and for the first time in the history of the church he ordered this costly new dress and publicize that this should be the dress of a Patriarch. During that time it was fascinating for the faithful when they observe that the new Patriarch first task was to worry for his dress design and color. Though many scholars of the church were against his new dress style for violating the age old tradition, some took it for granted considering his relatively young age and the cultural influence he may have faced from his stay in United States of America while studying for his masters and PhD. He then changed the previous title of Patriarch and came up with new and long title: Patriarch Paulos, head of all Archbishops of Ethiopia, Ichege of the see of Tekle Haymanot and archbishop of Axum. It was fascinating for every follower of the church, again, why this patriarch was so hungry of power and authority this much. 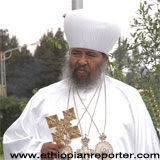 The reason why he singled out and took the title of Axum Archbishop was also a puzzle for many. 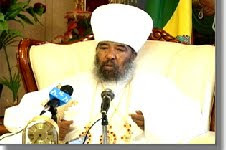 fundamentalist, Catholic or protestant movement since a huge segment of the population of Ethiopia is follower orthodox religion still and for the inefficient leadership Abune Paulos is exercising in maintaining its flocks . like Abune Matios, Abune Samuel, Abune Kerlos and other confronted the Patriarch. Ethiopia, Catholics bishops have blessed the poison gas and other weapons which were used to kill Ethiopian Orthodox Monks and priests and other citizens. They even gave their golden cross as a support to the invading army. To that end concerned Ethiopians were asking, time and again, Vatican to apologize for that dark history. But his holiness has zero courage to confront such issues. Rather to warmly welcome them. irresponsible and ethnocentric leadership of Patriarch Paulos and the unnecessary huge negative interference of EPRDF government on the issue of the church are threatening the legacy of the church. the church is needed to exist in the coming centuries, avoiding him is an imperative task. concerned Ethiopians should think now, before the time is over. ከቅርብ ጊዜያት ወዲህ በተከታይ ብዛትም ሆነ በአመጣጣቸው ግንባር ቀደም ሚጠቀሱት የእስልምናና የክርስትና እምነት መካከል የሚፈጠረው ግጭት፣ ብዙዎችን ያሳስባል፡፡ ይህ ኢትዮጵያ ውስጥ ያልተለመደና አዲስ ክስተት ከጊዜ ወደ ጊዜ እየተበራከተ መምጣት መንግሥት፣ ሕዝብንና ምሁራንን እያነጋገረ ነው፡፡ አንዳንድ ምሁራን በግጭቶቹ መነሻ ጥናት በማቅረብ መፍትሄ ይሆናል ያሉትን እየጠቆሙ ነው፡፡ ሕዝቡም በተለያዩ አጋጣሚዎች እነዚህ ግጭቶች የጥቂቶች አጀንዳ እንደሆነ ሲገልፅ በስፋት ይስተዋላል፡፡ የሃይማኖት አባቶችም ቢሆኑ፣ በተለያዩ አካባቢዎች በተለይ ሃይማኖትን መሰረት አድርገው የሚነሱ ግጭቶች ለመፍታት እየተንቀሳቀሱ እንደሆኑ ይገልፃሉ፡፡ በየፈርጃቸው ሰላምንና ፍቅርን ይሰብካሉ፡፡ የእያንዳንዱ ሃይማኖት ተከታዮችም ግጭት ቀስቃሾቹን ለሕግ እንዲቀርቡ ሲጠይቁ ይስተዋላሉ፡፡ ታዲያ የሃይማኖት ግጭቶች መንስኤ ምንና ማን ይሆን? አክራሪነት - ኪራይ ሰብሳቢነትና የ..ከሰሩ ፖለቲከኞች..
Ethiopian Orthodox Tewahido Church (EOTC) is one of the ancient apostolic churches, having multi million followers with in and out side Ethiopia. This historic church has flourished for more than 1,600 years in the country, serving its followers and fulfilling the orders of Christ. It has also contributed significant share for the civilization of the country. The educational, health, economic, political, social and many other affairs of the country were significantly handled by the church scholars. Spiritual fathers even were playing fundamental role in defending the country against foreign invasion. The history of the priests who marched to Adwa, carrying the Arc of St Giorgis and the patriotic death of the archbishop martyr Abune Petros are some of the testimonies to this premise. The incident was like this. All of a sudden Aba Sereke Birhan, the newly appointed head for the Sunday School Department of EOTC, started questioning Mahibere Kidusan. With in few days, he called for a meeting to resolve the administrative problem encountered with this association.Ato Abay Tsehaye, the intelligence and security advisor of the state and Dr Shiferahu Tekle Mariam , federal affairs minister were invited to settle this administrative problem between the department head and the association (3) . One can imagine how much silly can it be when officials at ministry level are invited to participate on the meeting which was intended to resolve the administrative problem between one spiritual association and its department head. The actual reason was far beyond that, actually. It is beyond funny when Aba Sereke accuses Mahibere Kidusan for reporting the unfairness of the agreement to hand over students who were sheltered in Saint Marry church in 1993, on its newspaper Simea Tsidk. 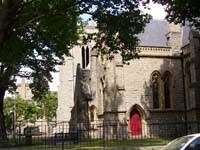 During that time, the students don’t want to participate on any kind of violence and went to the church of Saint Marry, in search of peace. Other students also went to another place for the same purpose. But those students who were in Saint Mary church was taken by security force and thrown to different jails. This was ridiculous. Reporting this was crime of Mahibere Kidusan for Aba Sereke and the officials. The validity and the reliability of the result of the recent census conducted in Ethiopia was also questionable for many citizens and any logical person. For reason which is hard to accept, millions are missing. Besides, the issue whether monks, hermits and nuns who are living in far places and in accessible monasteries and nunneries are counted or not was also under debatable question. Shedding light upon this issue was a crime Mahibere Kidusan committed for Aba Sereke and the officials. Archbishops’ house was broken, for the simple reason that they opposed the corruption, racism and other unethical deeds in the church. Even some were intimidated and harassed. Opposing this open crime is again wrong as per the eyes of the “enlightened” officials. Despite the strong opposition and evidence Mahibere Kidusan portrayed for not involving in politics, the ministers have insisted it has shown inclination. Ato Abay has also given warning for it: a warning for no valid reason. Pro government Medias,fans of the Patriarch’s and others are posting different article about Mahibere Kidusan since then. Aiga forum, Pro EPRDF government web page has posted the following analysis regarding the secret network between Addis Neger newspaper (notorious newspaper according to them) and Mahibere Kidusan. In a nut shell, many “concerned religious bodies” are repeating Ato Abay Tsehaye's sentence in different words. Though the name of the organizations differs, the idea they generate is the same. Even the words they used to denounce Mahibere Kidusan are similar. It seems that they originate from the same root source. . Many things are getting very clear now. Though the constitution prohibits any government involvement in religious activities, practically government bodies are dictating as to what religious leaders should discuss and what not, in the holly synod. I don’t think so that even the then Marxist government did this. Why do government requested the archbishops not to raise the issue of Mahibere Kidusan on their meeting? It is self explanatory. After few days arrest news on targeted members of this association like Dn Daniel Kibret will be announced. I know different bodies have different attitudes about Mahibere Kidusan. Despite what so ever feelings and attitudes we have however, no one denies the significant contribution this association made to EOTC. This association, hand in hand with different concerned bodies, has established Gibie Gubaes in every higher learning institutions of Ethiopia. For the first time in Ethiopian History of Ethiopia, Mahibere Kidusan has prepared spiritual curriculum and structured spiritual education for these institution students. One can state many achievements the association did: the books, magazines, tracts, newspapers and etc published; the projects implemented for different ancient monasteries, the spiritual songs released , the web pages constructed, the radio station started and so on. Attacking Mahibere Kidusan is attacking all these sacred objectives and deeds. By the time when every religious institution is so organized to steal sheep, weakening and eventually dismantling the churches strong youth structure do have its own negative impact for the church .Every follower of Tewahido Christian, despite what so ever difference we have, shall fight this attempt. The government bodies should also think upon what they are doing critically. Dismantling a peaceful spiritual association which do have around 50,000 highly educated members may have its own grave consequence. Their irresponsible act is leading many youths to another extreme end. Many members are expressing their anger through various means since the very beginning of this attempt. It may even lead to other crises in the country since government officials are intimidating innocent youths who have never involved in any type of conspiracy except exercising their religion peacefully. Government may boast for crushing so many political riots and parties and consider dismantling Mahibere Kidusan as a simple task. It is advisable if the government thinks upon it again and again. The zeal and anger every member is exhibiting now is a huge potential for the association too. Members are seen and heard expressing their commitment more than any other time. In the mean time, the nation from east up to west has got the opportunity to truly know who Mahibere Kidusan is Those at the leading position of this association should devise method to tap this huge resource to the betterment of the church. ኢትዮጵያ ዜና አገልግሎት - "በቤተክርስቲያኗ አባቶች መካከል ተፈጥሮ የነበረው አለመግባባት መፈታቱ ተገለፀ"
ውድ ENA፦ ለመሆኑ እነዚህ የተባሉት አባቶች መቼ ተገናኝተው ተነጋገሩ? በምን ጉዳይ ላይ ተነጋገሩ? ማን ዳኛቸው? ነው ወይስ እነ እንትና የሰጡትን ማስጠንቀቂያ እንደ ችግር መፍቻ ተቆጠረ። ወይ ጉድ!!! 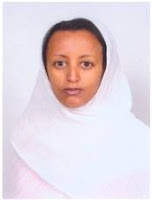 ይህ ከዚህ በታች ያለው የ“ENA” ዜና ስለ ቤተ ክርስቲያናችን “ዕድገት” እና “ጥንካሬ” የሚያትት ነው። በርግጥ ለሚዲያው ፍጆታ እና “ለመሸዋወድ” ይጠቅም ካልሆነ በስተቀር ቤተ ክርስቲያናችን ያለችበት ሁኔታ መቸም አይጠፋንም። ገዳሞቻችን እንዴት እንዳሉ፣ ምዕመናችን ያለ እረኛ እንዳለ፣ የገጠር አብያተ ክርስቲያናት “የካህን ያለህ” እያሉ በመዘጋት ላይ መሆናቸው የአደባባይ ምሥጢር ነው። ለቤተ ክህነት ሃላፊዎች ግን ይህ ሁሉ የለም፤ ሻምፓኝ ለመክፈት፣ ኬክ ለመቁረስ ደግሞ አሁን “የልማት አርበኞች” የምትባል ፖለቲካ ቀመስ ፋሺን ጀመሩ። አሳፋሪዎች!! !